This item is a Paper in the WWW in lbero-America track. E-commerce is growing at an exponential rate. In the last decade, there has been an explosion of online commercial activity enabled by World Wide Web (WWW). These days, many consumers are less attracted to online auctions, preferring to buy merchandise quickly using ﬁxed-price negotiations. Sales at Amazon.com, the leader in online sales of ﬁxed-price goods, rose 37% in the ﬁrst quarter of 2008. At eBay, where auctions make up 58% of the site’s sales, revenue rose 14%. In Brazil, probably by cultural inﬂuence, online auctions are not been popular. 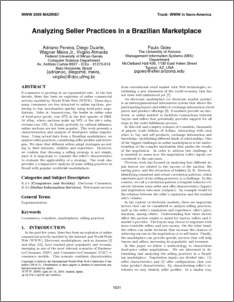 This work presents a characterization and analysis of ﬁxed-price online negotiations. Using actual data from a Brazilian marketplace, we analyze seller practices, considering seller proﬁles and strategies. We show that different sellers adopt strategies according to their interests, abilities and experience. Moreover, we conﬁrm that choosing a selling strategy is not simple, since it is important to consider the seller’s characteristics to evaluate the applicability of a strategy. 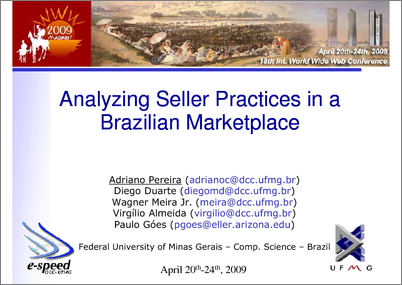 The work also provides a comparative analysis of some selling practices in Brazil with popular worldwide marketplaces.